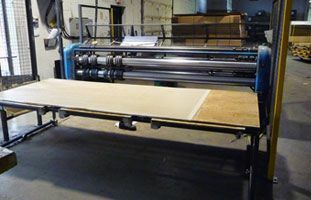 Slit Scored Sheets & Pads - Independent Corrugator Inc.
Packaging manufacturers require scored and slit scored corrugated sheets and pads for box inserts, display dividers and fillers. It’s for this reason that many of the leading companies in the industry turn to our expert team, who ensure timely turnaround from our slitter operation for shipping, display and packing requirements. ICI’s in-house expertise within this area ensures clients receive corrugated sheets and pads made to your specifications. Slit scored options – Doublewall or singlewall material can be slit scored both with and against corrugation, innerface and outerface scores. Ideal for taking the “memory” out of corrugated board for use as corner posts and edge protection. 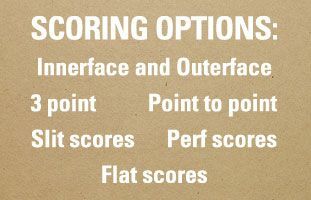 Conventional scoring options – Whether you require one score or multiple scores the ICI team is at your service. You have the choice of horizontal and vertical scores. Point-to-point, 3-point and Male-to-Flat scoring options, innerface and outerface scores. Sheet size limits from 15″ x 3″ up to 77″ x 115″. In some cases even as small as 10″ x 3″. Speak to our sales service staff for more information. Full colour or functional coating options – The use of the I-COAT™ system ensures that each of the corrugated sheets and pads produced by ICI can be applied with a colour or functional coating. This makes our slit-scored sheets and pads solutions ideal for those unique packaging requirements in which one of our many coating options can help make the difference in terms of appearance and performance. ICI continues to define excellence within the corrugated industry. Organizations including shipping companies, packaging, and display manufacturers can now reduce their project costs and improve turnaround times by choosing ICI for high quality corrugated sheets and pads. For more information, or to place an order, contact us today.